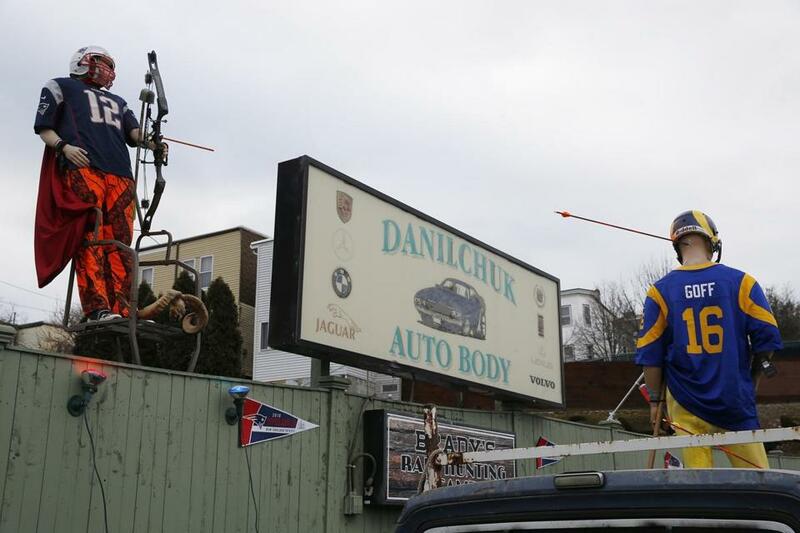 A Super Bowl display outside of Danilchuk Auto Body in East Boston. The display has become a familiar sight outside an East Boston auto body shop around Super Bowl time: a Ford Bronco painted in bright New England Patriots blue, paired with an old wrecker representing whatever unlucky team stands between the Patriots and another championship win. This year, Danilchuk’s display pairs the Patriots with the Los Angeles Rams, represented by a run-down old Dodge Ram pickup truck, parked bumper-to-bumper with the Ford. Danilchuk, an avid bow hunter, summed up the scene: “Let’s go ram hunting,” he said. The display received plenty of honks from passing drivers on Sunday afternoon, including more than a dozen people who stopped to take pictures of the scene. Anna Ruggiero, one of the admirers, said she looks forward to Danilchuk’s displays every year. But not everyone was pleased with the display, including a Winthrop man named Julio. Danilchuk started creating the displays back when the Patriots faced off against the Green Bay Packers in the Super Bowl back in 1997, and has created similar presentations for the Patriots, as well as the Red Sox, Celtics, and Bruins over the years. He said he gets calls from Patriots fans each year around playoff time, asking about when the latest display will go up along Route 1A. And the bulk of the presentations have honored the Patriots, which have been praised for not just being one of the best teams ever in football, but in professional sports, period.